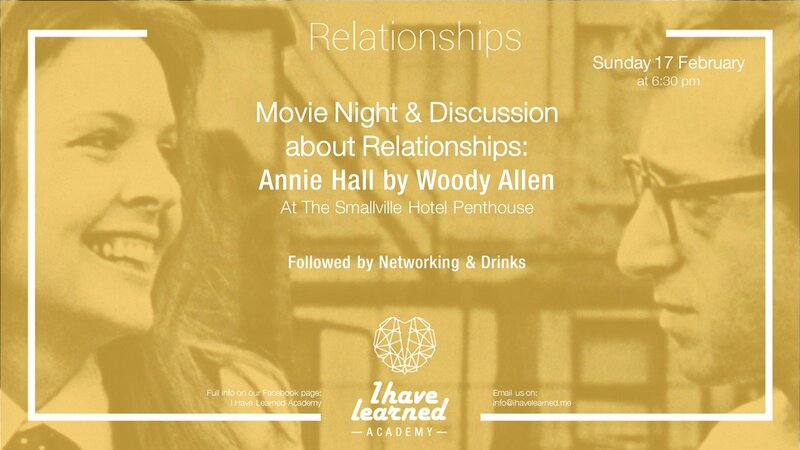 This event is organized by I Have Learned Academy and will take place at The Smallville Hotel Penthouse. Special Relationship theme for this Valentine Week! Comedian Alvy Singer (Woody Allen) examines the rise and fall of his relationship with struggling nightclub singer Annie Hall (Diane Keaton). Speaking directly to the audience in front of a bare background, Singer reflects briefly on his childhood and his early adult years before settling in to tell the story of how he and Annie met, fell in love, and struggled with the obstacles of modern romance, mixing surreal fantasy sequences with small moments of emotional drama. The Movie will be followed by a discussion around Relationships. We will be hosting couples at different stages of their relationships to share with us practical lessons and thoughts. After that we will have a time for Networking and Drinks. Movie & Discussion Entrance is for 10$ including Popcorn. Food & Drinks a la carte. Free Popcorn bags offered by Maizing Popcorn. Booking ahead is a must, places are limited. Or offline from Khoury Home or Malik's Bookshop all branches. BOOKING AHEAD IS A MUST.